It's your big day, so announce it with pride! 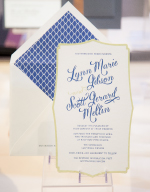 Find beautiful wedding invitations and stationary that your guests will love from these top vendors in Las Vegas. Invitations, ceremony cards, reception cards, response cards...when do you mail them and where do you put those little pieces of tissue paper? Working with a professional stationery store can make your life so much easier. Even if you are a DIY bride, there is much they can help you with. See the list of professionals below and check out their websites or come meet them at The Bridal Spectacular. Paper and Home specializes in couture engagement announcements, bridal shower invitations, save the dates, wedding invitations, thank you notes, and day-of wedding accessories. Come visit our graphic design studio and boutique at 4555 S. Fort Apache Road, Suite 138, Las Vegas, Nevada 89147. Let The UPS Store save you time and money with our Full-Service Wedding Invitation Packages.Our low-cost of $7.99 per set include customizable design options, choice of paper stock and envelopes, addressing, postage and mailing fulfillment for Save the Dates, Announcements with Response Cards and Thank you Cards.